This is one of Dr. Hanson’s “Big Ideas on Optimal Living.” Having talked about Heart to Heart connection in previous blogs below, I think Hanson’s ideas come from his scientific book entitled Buddha’s Brain, co-authored with another Psycho-neurologist. This above quote makes sense from his research and practice of Buddhist principles, himself. His quote also makes good sense, in the context of considerations throughout my other blogs as we deal with “cultural blind-spots.” Also, Rick Hanson will host 7 special people from July 15 to September 2/2013. So let’s experiment for ourselves. It will likely take some practice but this is headed in the right direction. As Hanson says: “Take a moment to relax and set aside your opinions about them and be open to who they really are, with their struggles, emotions and hopes for happiness. Let that recognition of the person behind the eyes show in your face, in your own eyes. Notice how this recognition changes the course of an interaction – perhaps softening it, making it more authentic, leading to a good resolution more gently and quickly.” Thus, we get the idea that being inspiring is not just a “manipulative trick.” It is actually being real and acknowledging the other person as real too! People in today’s world who are good at being real are less than one year old! Yes! Because they haven’t built a list of mental interpretations of what’s going on in older people’s minds, which affects their persona. Also, people older than one year, start to get a persona that works best around people who have what Hanson calls “our deepest thoughts and feelings.” A good example of this a toddler having a loud cry for the mother to relent and give them what they see and want, and are often able to “read” the mother’s embarrassment about what others will think in public. 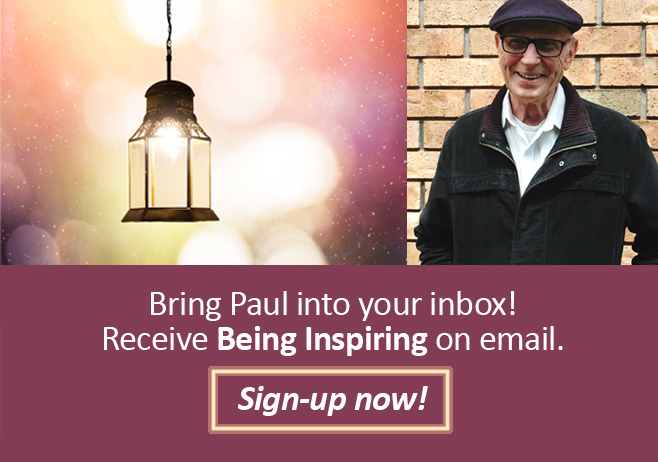 Is being inspiring impossible? Deep in our Hearts we know it’s possible. Otherwise I wouldn’t write this blog and you wouldn’t bother accessing the blog-site anyway. We can all think of moments when it happened. If not, we are inspired by someone else’s inspiration. It is fun and costs nothing. In my first blog, called Caution- Nihilism Ahead!, I wrote: “Recently, I went to the bank and I had to wait for the teller to return to her post. She was smiling and 40 years younger than I. She said: “I thought everything was ready, but I’m sorry to keep you waiting.” I said: “Your smile is worth waiting for!” She replied: “That’s sweet!” It’s hard to say which of us was more inspired!